The ment’or BKB Foundation oversees, and funds, the USA’s participation in the biannual Bocuse d’Or International Culinary Competition. Inspired by Team USA’s unprecedented Gold Statue at the Bocuse last year ment’or is now funding, and building, a dedicated training kitchen for Bocuse d’Or Team USA located at the Culinary Institute of America at Copia’s campus in Napa. Scheduled to open in Spring 2018 ment’or’s hope is that this kitchen will become a permanent home for the Team. Chef Pascal Olhats of Pascal San Juan Capistrano is recognized as the Dean of French Chefs in Orange County. He’s mentored numerous rising star chefs now cooking in Orange County. 2018 marks his 30th year of being a restaurateur in Orange County. There will be special celebrations and menus to commemorate this worthy occasion. Culinary pioneer Chef Paul Bocuse, sadly, passed away in France on Saturday. Chef Pascal knew Chef Paul personally from his earlier career days in France, and actually worked for him in his flagship restaurant in Lyon. In the 90s Chef Bocuse visited Traditions by Pascal in Newport Beach to dine. Pascal shares some fond memories to start the interview. On Sunday, February 25th Pacal is hosting the 2nd year of The Gray Event benefit at Sherman Gardens to raise needed funds for the Save Elephant Foundation to rescue at-risk elephants in Thailand. Tickets for the elegant, seated 4-course dinner featuring the flavors of Thailand are $250, and Reception-only tickets with Thai appetizers and creative cocktails, beer and wine are $125. Pascal Olhats is an extraordinary French born, and trained, Executive Chef, and polished restaurateur. He has won numerous awards, owning and collaborating on a number of restaurants in Newport Beach over the past 30-years. He currently owns four businesses, including: Café Jardin Restaurant & Pascal’s Tea Garden Creperie (on the lush grounds of Sherman Gardens & Library in Corona del Mar), Pascal’s Café in San Juan Capistrano (a café/ bakery/ fine dining establishment), and Pascal’s Catering (offering full-service catering for 20 years throughout Southern California). Pascal also partners with Manassero Farms in Irvine, and orchestrates breakfasts, dinners, and incredible special events, often showcasing guest chefs. We’ll chat with Chef Pascal. We’ve been enthusiastically following Team USA’s progress (backed by the ment’or BKB Foundation) in the bi-annual Bocuse d’Or International Culinary Competition for the last five years. Late last month Team USA achieved the impossible – Gold in Lyon. Team USA’s primary backer and inspiration, ment’or BKB Foundation (represented by Executive Director Young Yun), joins us to savor this tremendous achievement for the culinary arts in the United States and also discuss the other programs ment’or sponsors and organizes to encourage young culinary talent and the Team USA competitors of the future. Go Team USA 2019 ! Shortly after leaving his post as Chef de Cuisine at The French Laundry in 2013, Chef Timothy Hollingsworth moved to Los Angeles and opened Barrel & Ashes in Studio City in 2014. It’s an updated take on traditional BBQ that pays homage to the food of Hollingsworth’s youth growing up in Texas. Late last month he debuted his first solo project, Otium. Located on Grand Ave. adjacent to The Broad – L.A.’s New Contemporary Art Museum in the Historic Bunker Hill neighborhood of Downtown Los Angeles, Otium strips away the formalities of fine dining while focusing on quality food and service. Chef Tim is our guest. Chef Timothy Hollingsworth’s 13- year history in Napa Valley, blended with his present roots as an Angeleno living in downtown Los Angeles, sets the stage for an environment of sophisticated rusticity with highly eclectic, vibrant, and seasonal flavors. While working at The French Laundry under Chef Thomas Keller in 2008, Hollingsworth competed in the Bocuse d’Or USA, where he was awarded the opportunity to represent the United States at the Bocuse d’Or World Cuisine Contest—the biennial global cooking competition first envisioned in 1987 by revered French chef Paul Bocuse. Hollingsworth subsequently completed a rigorous training process, during which he worked with some of the industry’s most influential figures. In early 2009, Hollingsworth traveled to Lyon, France to compete in the prestigious event, where he placed sixth out of 24 prominent chef teams from around the world. In his current role and first solo project at Otium, he looks to be a mentor to the next generation of aspiring chefs. Hollingsworth has been awarded Rising Star Chef Award from The San Francisco Chronicle as well as the Rising Star Chef of the Year Award presented by the James Beard Foundation. Kedric Francis (our always dashing, debonair OC gentleman-about-town,) Editor of Coast Magazine, is today’s special Guest Host. It’s a great time to reflect on the high points of the past year and look ahead. Kedric will share some of his thoughts on 2014 and look ahead to the anticipated edible treats of 2015. He’ll also preview the upcoming food and beverage options of the new $185 million ARTIC transit hub (67,000-square feet) adjacent to Angel Stadium and Honda Center.. When Chef Charlie McKenna opened the original Lillie’s Q in 2010 in the Bucktown neighborhood of Chicago he brought award-winning competition BBQ and timeless Southern cooking to the City of Big Shoulders. Now Chef Charlie and partner Joe Manzella of TAPS Fish House & Brewery and The Catch have launched Lillie’s Q in Brea Downtown. The joint venture marks McKenna’s fourth location for his growing barbecue concept. Chef McKenna is our guest. Cocktail authorities David Solmonson and Lesley Jacobs Solmonson are back with us providing inspired advice on New Year’s Eve libations. They are the authors of The 12 Bottle Bar – A Dozen Bottles. Hundreds Of Cocktails. A New Way To Drink. It’s been an epic year for our Friends at The Winery in Tustin and Newport Beach. The Orange County Concierge Association just awarded The Winery the designation of “Restaurant of the Year.” In unprecedented fashion The Winery also won this recognition from the OC Concierge Association in 2008, 2009, and 2013. At The Golden Foodie Awards this year The Winery took home the honor for “Best Wine list” for the third year in a row. Also in the Orange County Register’s restaurant critic Brad A. Johnson’s 2014 O.C. Restaurant Awards the new Winery in Newport Beach was in Johnson’s “Top 10 New Restaurants” (in the Number Three position.) Winery Managing Partner and Sommelier William Lewis joins us to share all the good news and their celebratory plans for New Year’s Eve. It’s our pleasure to welcome back Brad A. Johnson, the Orange County Register’s award-winning restaurant critic to the show. Brad is going to share his 2014 Orange County restaurant awards with us. 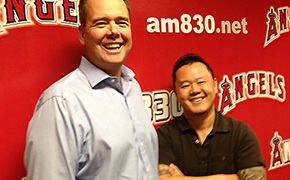 Additionally we’ll hear about his favorite Orange County dishes of the year. In mid-October Johnson penned an intriguing piece for The Orange County Register about the arrival of the new Italian cuisine. He characterizes it as “nothing short of a revolution.” We’ll hear about this movement along with the restaurants in Los Angeles and Orange County who are part of this exciting new wave. It’s a great time to reflect on the high points of the past year and look ahead. Kedric will share some of his thoughts on 2014 and look ahead to the anticipated edible treats of 2015. He’ll also preview the upcoming food and beverage options of the new $185 million ARTIC transit hub (67,000-square feet) adjacent to Angel Stadium and Honda Center. Cocktail experts David Solmonson and Lesley Jacobs Solmonson are back with us providing inspired advice on New Year’s Eve libations. They are the authors of The 12 Bottle Bar – A Dozen Bottles. Hundreds Of Cocktails. A New Way To Drink. Kedric Francis (our always dashing, debonair gentleman-about-Orange County,) Editor of Coast Magazine, is today’s special Guest Host. It’s a great time to reflect on the high points of the past year and look ahead. Kedric will share some of his thoughts on highlights of 2014 and look ahead to the anticipated edible treats of 2015. He’ll also preview the upcoming food and beverage options of the massive new $185 million ARTIC transit hub (67,000-square feet) adjacent to Angel Stadium and Honda Center. Since then he’s gone out on his own and can be seen Saturday mornings on CBS’ “Recipe Rehab.” He’s also a coach for Team USA for the upcoming Bocuse d’Or competition in Lyon on January 24, 2015. We’ll talk with Richard about Team USA’s (Chef Philip Tessier and Commis Skylar Stover of The French Laundry) chances for 2015 and what it takes to compete on the world stage in this prestigious and rigorous international competition (24 countries competing) known as the “Olympics of Cooking.” It’s an intense five and a half hour cooking challenge with thousands of cheering fans watching. When Chef Charlie McKenna opened the original Lillie’s Q in 2010 in the Bucktown neighborhood of Chicago he brought award-winning competition BBQ and timeless Southern cooking to the City of Big Shoulders. Now Chef Charlie and partner Joe Manzella of TAPS Fish House & Brewery and The Catch have launched Lillie’s Q in Brea Downtown. The joint venture marks McKenna’s fourth location for his growing barbecue concept. Lillie’s Q specializes in slow-smoked pork shoulder, tri-tip, baby back ribs, hot links, and chicken cooked in custom-built smokers over peach wood and lump charcoal. They are also known for their incredible array of standout award-winning sauces. Chef McKenna is our guest. Opinionated cocktail authorities David Solmonson and Lesley Jacobs Solmonson are back with us with inspired advice on New Year’s Eve libations. They are the authors of The 12 Bottle Bar – A Dozen Bottles. Hundreds Of Cocktails. A New Way To Drink. The Solmonsons are going to discuss how to get the hosts out from behind the bar on New Year’s Eve so they can enjoy their own party. We’re perhaps thinking of a spirited punch and champagne cocktail bar. It’s been an epic year for our Friends at The Winery in Tustin and Newport Beach. The Orange County Concierge Association just awarded The Winery the designation of “Restaurant of the Year.” In unprecedented fashion The Winery also won this recognition from the OC Concierge Association in 2008, 2009, and 2013. The Winery’s Managing Partner and Sommelier, “Sir” William Lewis, joins us to share all the good news and their celebratory plans for New Year’s Eve. We’ll hear about this movement from Johnson along with the restaurants in Los Angeles and Orange County who are part of this exciting new wave.